The Japanese fireworks which first started about 400 years ago have become one of the world's best. TAMAYA KITAHARA FIREWORKS Co., Ltd. has introduced new techniques to the Japanese tradition since we were founded. We have been pursuing the fireworks as an entertainment, using the advanced computerized firing system and introducing the dynamic Pyromusicals, the total integration of music into fireworks. Having been highly regarded with our entertaining work, we have been spreading our field to Europe, China, USA, and the Middle East as well as in Japan. Regarding fireworks and any related events, feel free to contact us! The city of Shanghai made public recognition of our big project with 100,000 of massive fireworks at Shanghai International Music Fireworks in Shanghai, China in October, 2000. With that as a start, we have constantly displayed fireworks in Europe, Asia, and the Middle East. We believe our work has become well-known for its highly skilled show technique as represented by the championship at International Fireworks Festival in Barcelona, Spain. 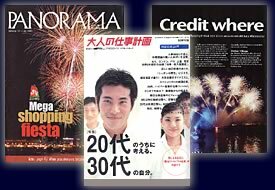 Many of our works have been reported in magazines in Japan and overseas. The Japanese magazine called "Career Planning for Grown-ups" by Recruit co., Ltd introduced our very first business chance overseas and its advantages in a special feature article "Work abroad with Our Traditional Japanese business". 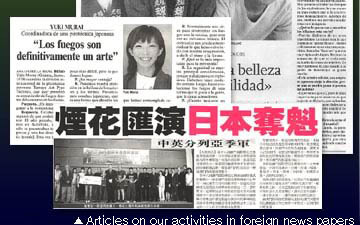 We were interviewed on our activities and it appeared on TV Tokyo in 2003. Company name TAMAYA KITAHARA FIREWORKS Co., Ltd.